Ottawa, Ontario (October 1, 2014) – The African Institute for Mathematical Sciences (AIMS) arrived on Parliament Hill with a stunning update on its Next Einstein Initiative. Though the next prodigy still eludes it, with Canada’s help AIMS has produced an impressive array of more than 731 graduates from 41 African nations with more than 30 per cent of these scholars being women. 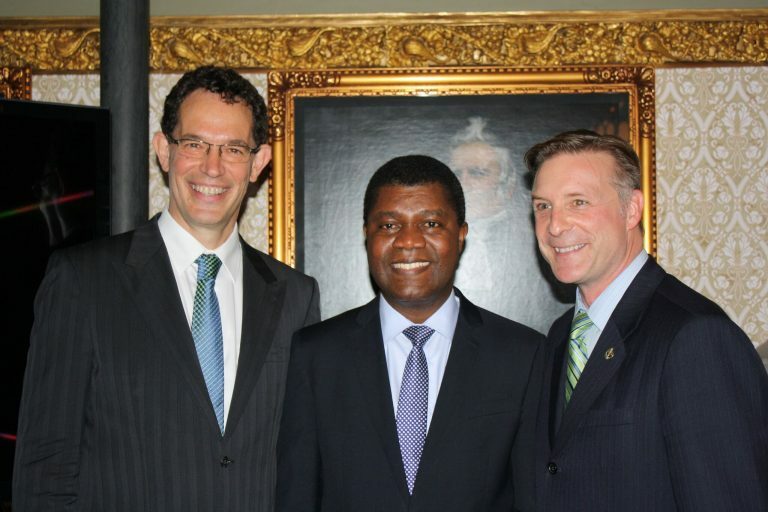 AIMS Chairman and Founder Prof. Neil Turok and President and Chief Executive Officer Thierry Zomahoun celebrated with a special update for parliamentarians and diplomats at an event on Parliament Hill. The effort is timely as economies in Africa have been experiencing phenomenal growth in the past five years. The Economist forecasts that from 2011 to 2015, seven (Ethiopia, Mozambique, Tanzania, Congo, Ghana, Zambia and Nigeria) of ten of the world’s fastest growing economies were in Africa. These countries will see economic growth rates between 6.8 and8.1 per cent. The demand is exploding for a generation of youth that apply science and math to ensure rapid and stable social, economic and political development. Only six per cent of post-secondary aged Africans are enrolled in apprenticeships, colleges or universities, compared to the global average of26 per cent (UNESCO Institute of Statistics, Montreal, 2010). In Europe and North America the enrollment ratio is as high as80 per cent. InCanada, the enrollment ratio is about 75 per cent of post-secondary aged Canadians (World Bank 2011). The AIMS - Next Einstein Initiative (AIMS-NEI) is playing a major part in closing this gap in Africa, having opened centres of excellence for postgraduate training, research and outreach in South Africa, Sénégal, Ghana, Cameroon and Tanzania. The plan is to create a network of15 centres across Africa graduating thousands of mathematical sciences experts - half will be women - annually by the year 2023. Turok, a South African-born physicist known for his work in cosmology, developing and testing theories of the big bang, founded AIMS in 2003. He believes that building capacity in mathematical science is one of the smartest ways to contribute to Africa’s development, by investing directly in talented young people, in an efficient, transparent and highly cost-effective way. AIMS’ success has made governments and key technology businesses sit up and take notice. The Canadian government made a major investment of CDN$20 million in 2010. The United Kingdom and Germany have also invested in the project. Twenty-six universities from Canada, Europe, Asia and Africa are participating, including the Universities of Ottawa, Guelph, Waterloo, British Columbia, Simon Fraser and Victoria. Why focus on mathematical sciences? Because mathematics underlies every modern technology from plumbing to electricity, smartphones to satellites. Its applications range from modelling and planning for economics, communications, transport, energy and health. Yet, it is also completely cross-cultural and free to share. Mathematical science is the foundation for development. Many AIMS graduates have gone on to leading positions in civil institutions andNGOs, as well as in universities, research centres and companies across Africa. AIMS is also planning the Next Einstein Forum (NEF), a global forum for science, the first ever to take place on African soil in 2016. Through the NEF, AIMS sets out to establish Africa as the next hub for global science.